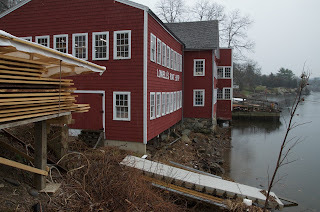 Last winter I lectured at Lowell's Boat Shop in Amesbury, Massachusetts. The lecture poster showed a photo of a Japanese tub boat (taraibune) and a donor saw the image and asked the Shop to commission a boat for him. So I returned in November and built one over a two-week residency. 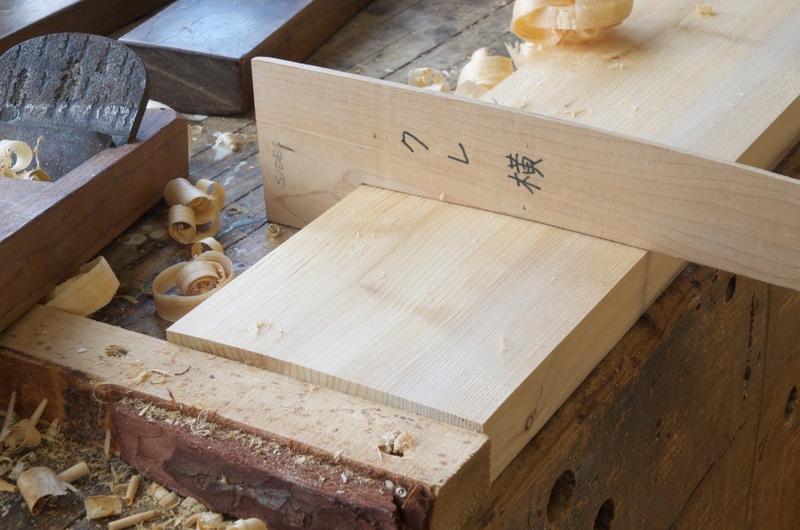 I brought northern white cedar from Vermont and we ordered excellent quality timber bamboo (madake, or phyllostachus bambusoides) from the Big Bamboo Company in Dudley, Georgia. First, a bit about Lowell's. Boats, principally dories, have been built on this site since 1793. 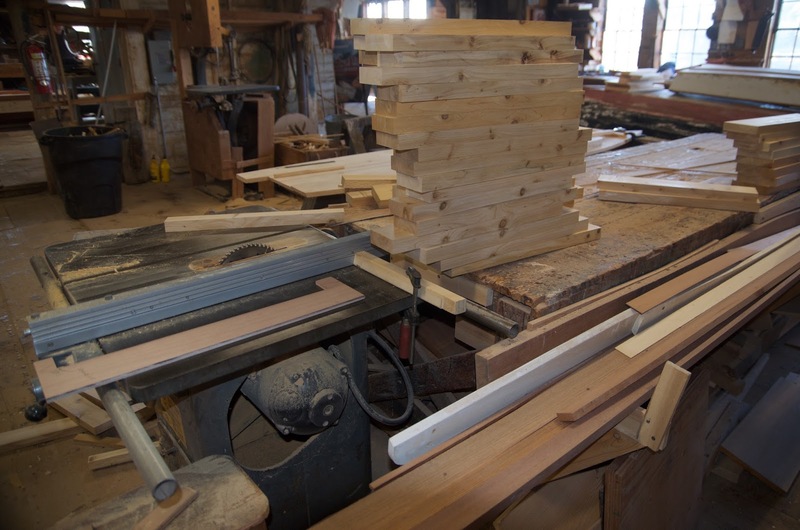 The shop was in continuous operation until the late 1980's when it began to transition to its current status as a non-profit museum, boat shop, and school. 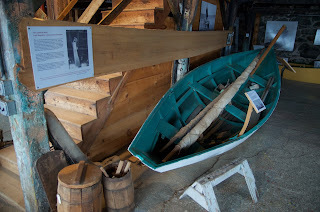 In its heyday thousands of dories were built here to supply the New England fishing industry. 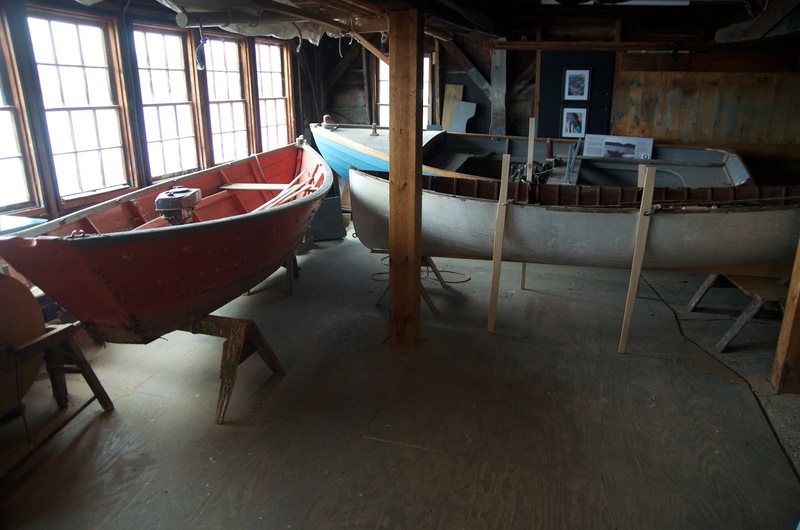 Dories and other boats are built for customers in the high school apprentice program. The museum has an interesting collection tracing the 200+ year history of the shop. Tub boats are still found in use today on Sado Island, part of Niigata Prefecture. 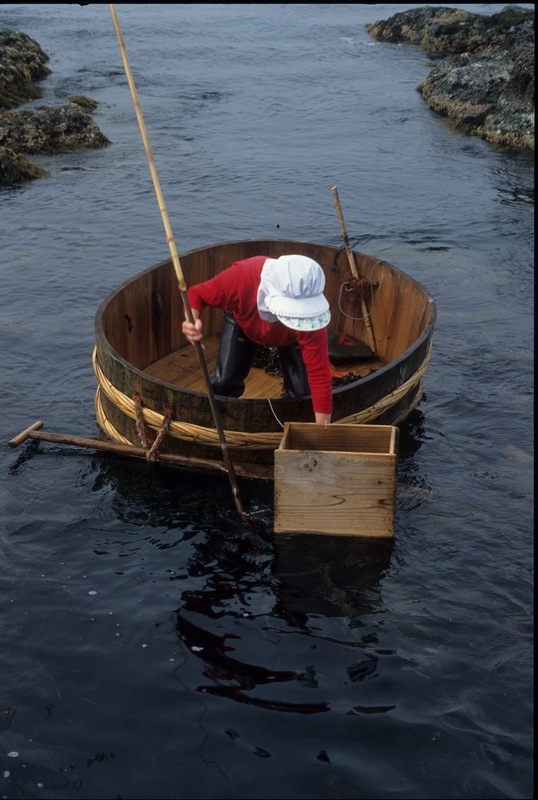 Primarily used by women, these boats survive because they were cheap and durable. This woman is shown fishing using a wooden box with a glass bottom. After sighting shellfish or seaweed she uses a wooden spear to gather the catch. Also visible is the paddle used to propel these boats. I apprenticed with my teacher, Mr. Koichi Fujii, in 1996. 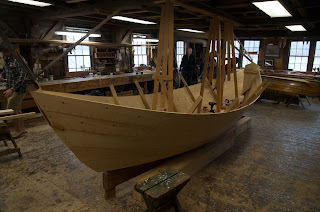 At the time he was the last professional builder of these boats and I was his only student. After his death a foundation supported the publication of my first book detailing how these boats are built. 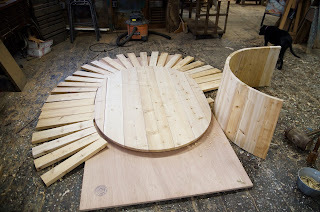 Now a new builder on Sado is making tub boats again. This boat was the sixth tub boat I have built: four in Japan and two in the United States. Last January I met a very interesting group of young Japanese teaching themselves coopering. I blogged about them here. I began building the tub boat by joining the bottom planking and then tracing the shape using a compass. 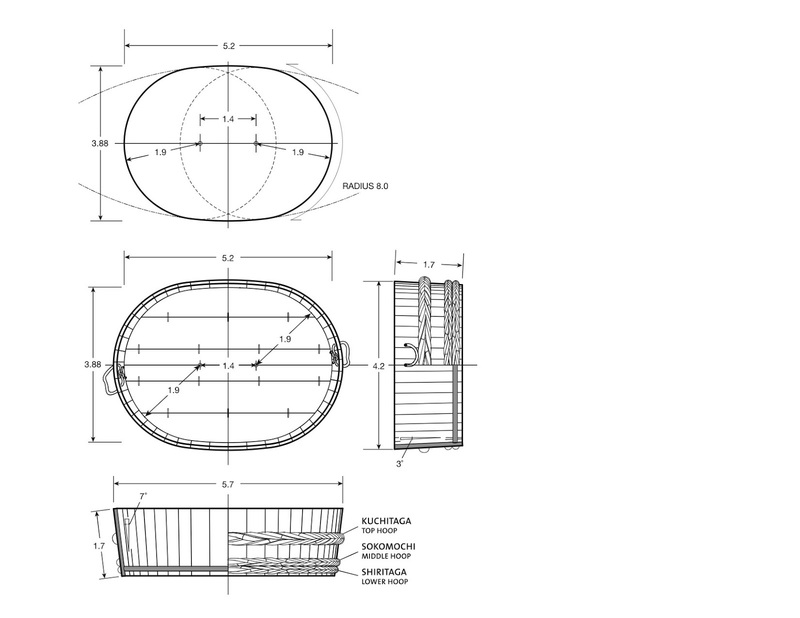 My drawings of my teacher's tub boat here shows how the bottom is shaped. All dimensions are in shaku, the traditional measuring system. One shaku is 11-15/16 inches. 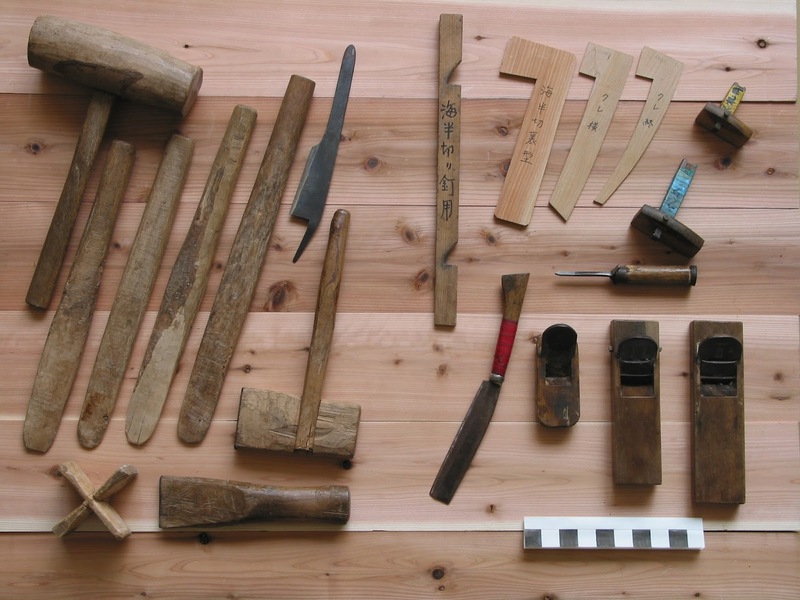 All planks, or staves, are joined with short bamboo nails inserted in hole made with a special boatbuilder's chisel called a tsubanomi. Each stave is tapered slightly, and I made a two-step taper jig to cut them on the tablesaw. My teacher used to do this by feel, just taking a few extra passes with the plane near the bottom edge. I flipped each piece and cut the second edge. 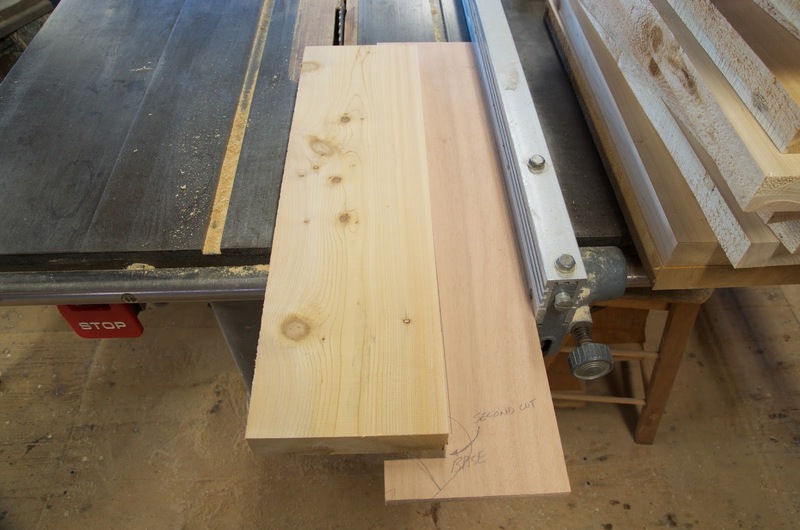 Note the notch in a slightly different place for the second cut. My teacher's tools, most of which his were given to me by his widow after his death. 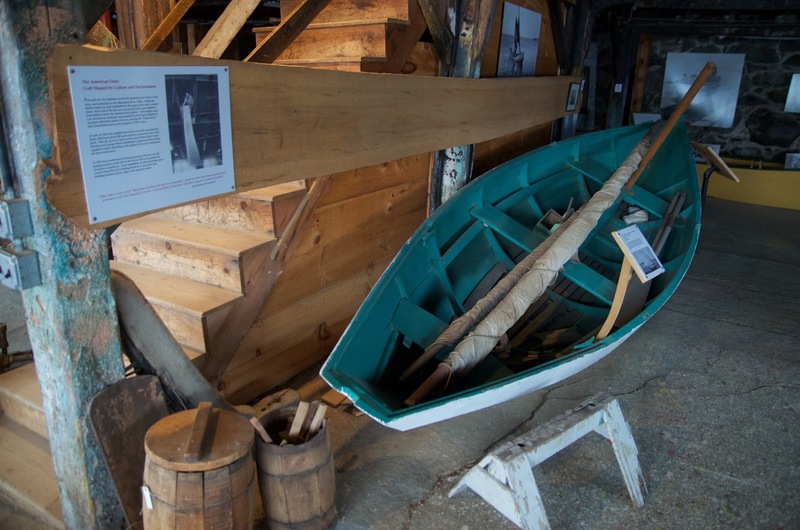 He built about one hundred tub boats in his career. Each stave has to be planed inside and out, concave and convex. 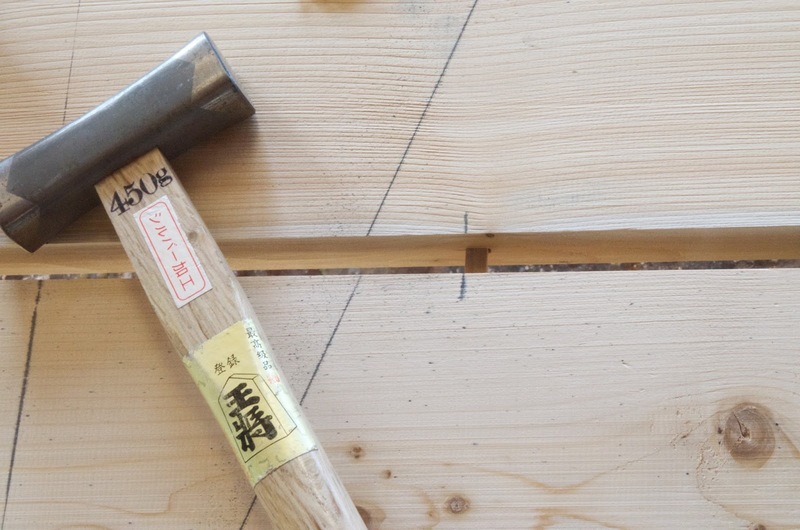 The classic Japanese cooper's pattern is used to check. 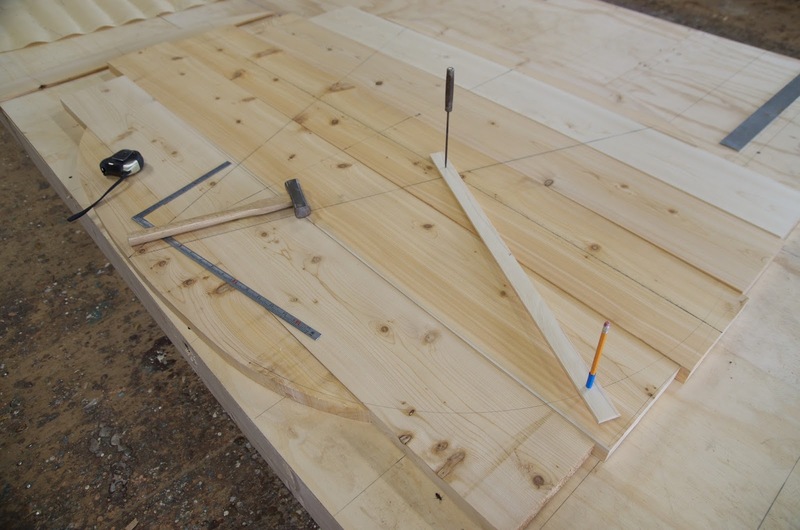 The inner edge is being used here to check the outside curvature of the stave while the outer edge is shaped to the inside curvature of the inner face of the staves. The corner of the pattern (can be seen better in the previous photo) has the proper angle for the edge. 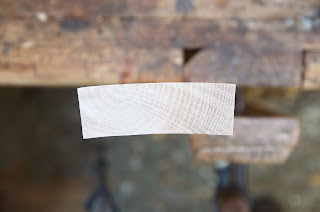 A look at a finished stave. 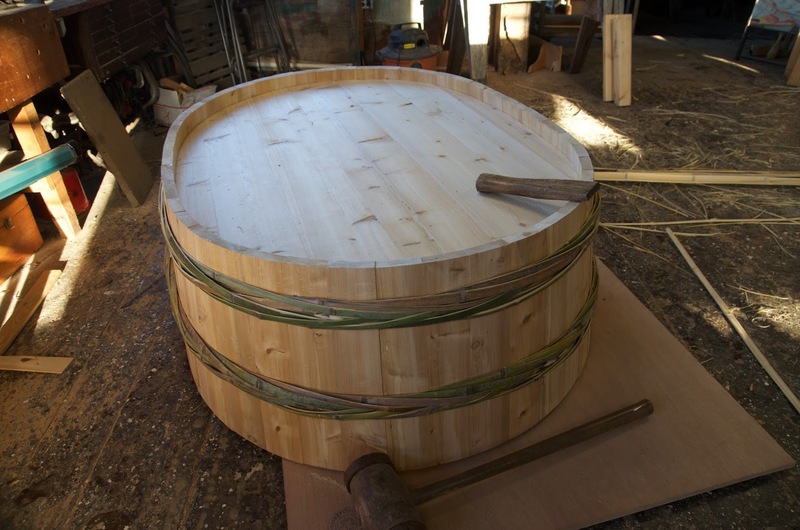 The tub boat is oval, so there are two patterns used: one for the ends and one for the sides. 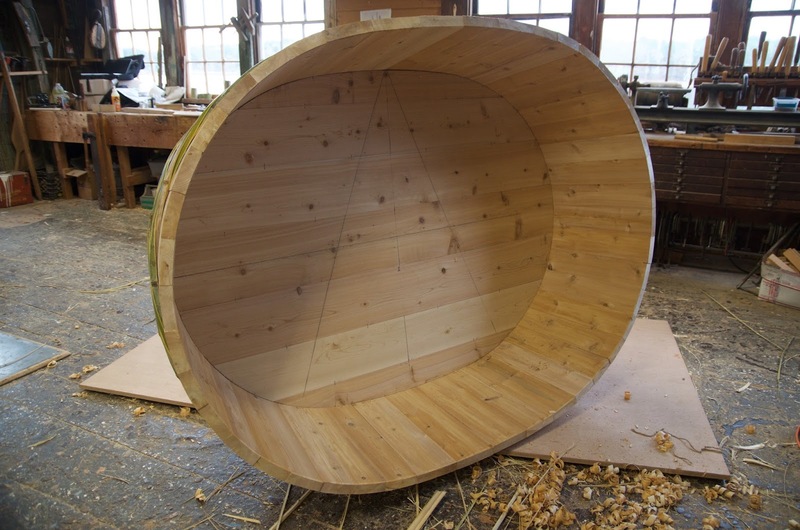 The tub boat I built in 2001 at the Peabody Essex Museum was outside swelling up. 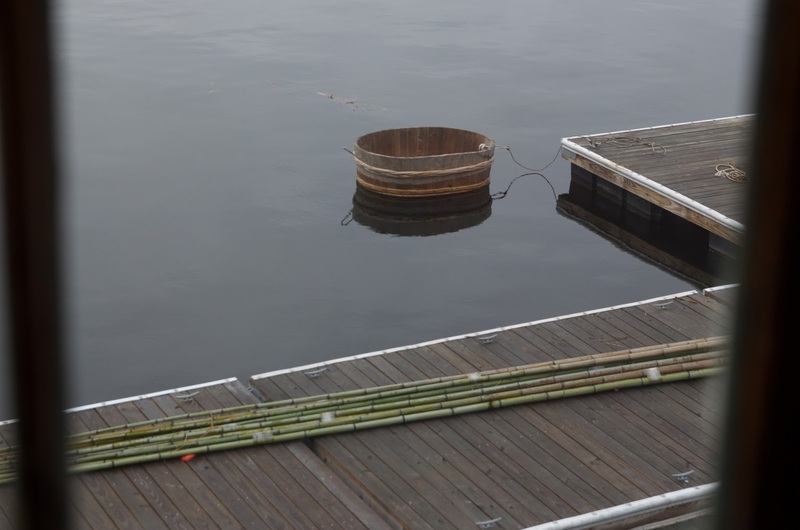 Also see our fifty-foot lengths of timber bamboo on the dock. 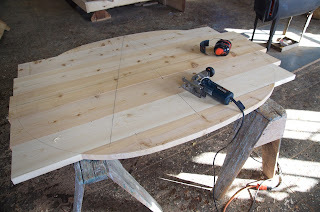 I have to carefully fit the staves around the bottom, making a custom stave or two to close the oval, then begin assembling them. 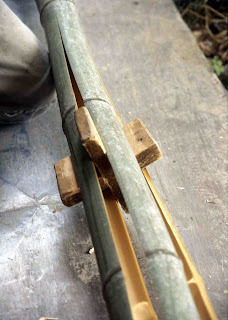 A pair of bamboo nails holds the side staves together. I used a ratchet strap to hold the sides together as well as a pair of braces. My teacher did neither; instead he would quickly braid a temporary bamboo hoop to hold the assembly together. The first hoop slipped over the strap and I pounded it tight to the hull. 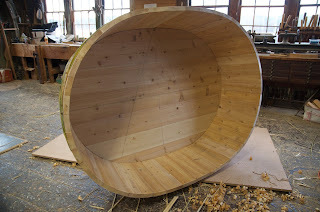 The hull is tapered and the hoops have to be braided exactly the right size so they fetch up in the right location. The sizing takes place when the initial foundation hoop is first made. 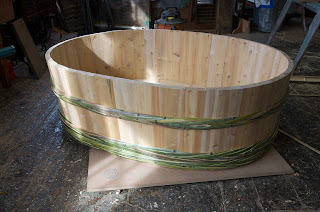 Once the bamboo is braided it locks together and the hoop's size cannot be adjusted. 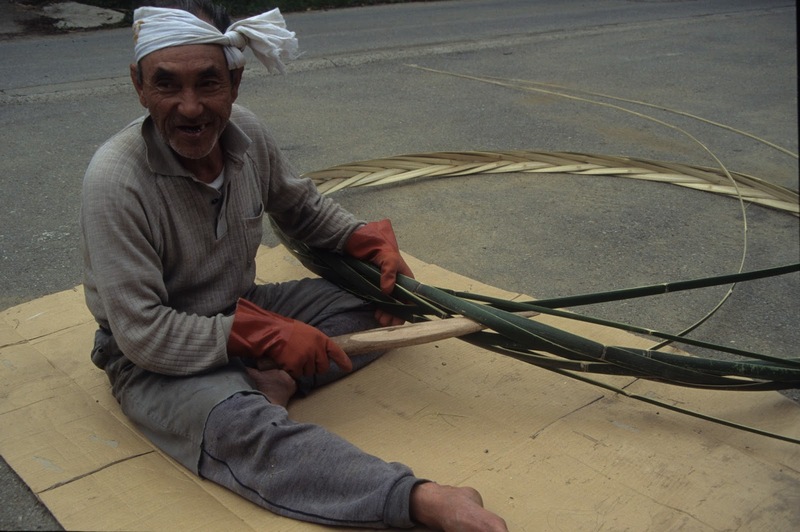 The bamboo is first split into four strips, then again to make eight. Each hoop is composed of four strips. 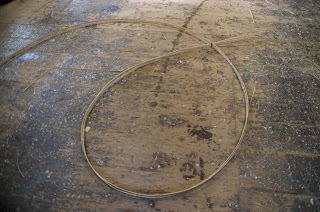 A photo of my teacher braiding a hoop. He's using a homemade fid to open the braid. 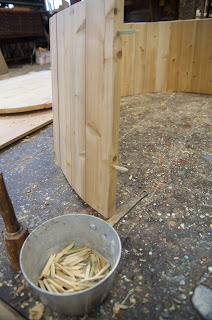 The steps, from left to right, showing the braid. Hoop #2 on the boat. 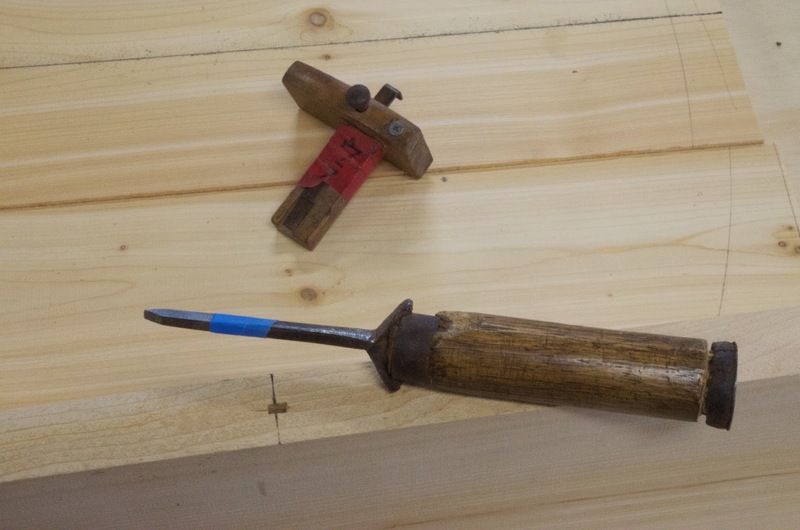 The hardwood punch and mallet are visible. 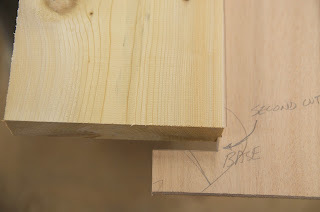 People always ask if the bottom is set in any kind of groove or rabbet. Japanese barrel makers do this but my teacher believed it was better for the tub boat's bottom to simply be a press fit. 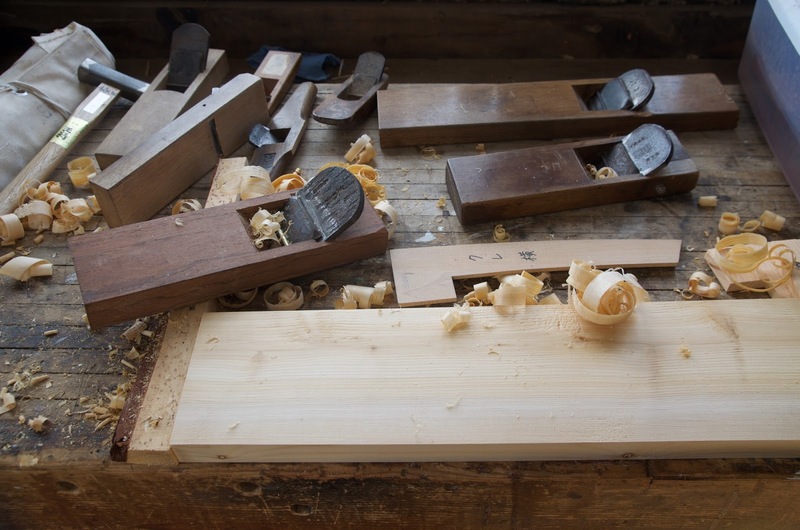 He thought the bottom could be then be pounded deeper inside the hull as the bottom edges of the staves wore off in use. 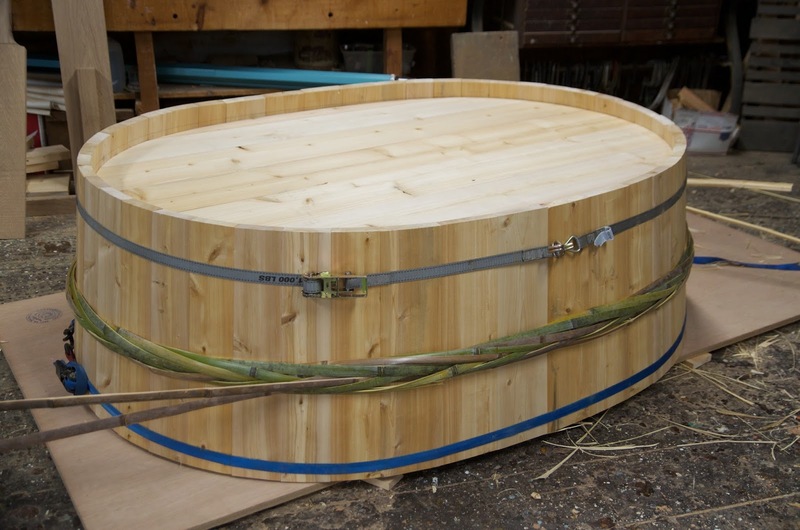 The finished tub boat. My thanks to the wonderful staff at Lowell's Boat Shop for making my wife and I feel welcome and I certainly hope I can return and build another boat there in the future. You once wrote that it would bring shame over the boat builder if the boat leaked when it was put in the water for the first time. I wonder if that also applies to such a tub boat? 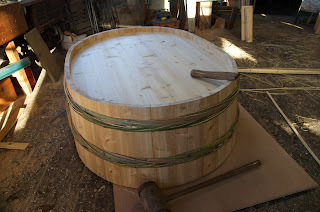 I assumed that it would, but since you posted the picture of the tub that is swelling, I thought that perhaps due to the difference in construction that it was more accepted that a tub needed to swell to become tight? The tub boat I brought with me to Lowell's I built in 2001 at the Peabody Essex Museum, and I think I last had it in the water in about 2009, so it was seriously dried out. I was actually surprised it eventually swelled tight at Lowell's (more or less). On Sado Island these boats are used almost daily so they just stay tight all the time. Honestly, I think even my teacher would admit a new tub boat might leak a bit, because the construction just offers a lot of chances for leaking. That said check out a blog post I wrote last January about a group of Japanese coopers I met. 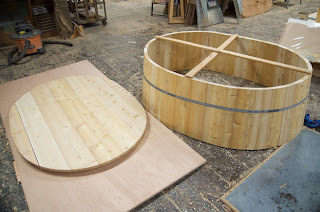 They were building eight foot tall soy sauce barrels and I was there as they filled on as a test. In about three places a the barest amount of water was seeping out and some present seemed pretty disappointed. I'd say no shame on them. 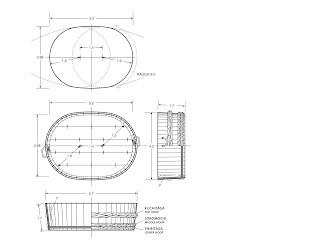 I remember that post, and I was just curious, because I also think that the tub construction would be much harder to get tight than a more "boat shaped" boat. I would say that being able to make a tub without caulking and not having it leak like a strainer is an incredible accomplishment.